Newsroom Home / NJAES Program Areas / Commercial Agriculture / What’s in Season from the Garden State: What’s Behind the Tomato Name? What’s in Season from the Garden State: What’s Behind the Tomato Name? Share the post "What’s in Season from the Garden State: What’s Behind the Tomato Name?" Sales from these tomato plants helped a truck mechanic pay off his $6,000 mortgage in the 1940s. Mortgage Lifter, Brandywine, Ramapo, Supersonic, Cherokee Purple. How do tomato varieties get these unique and sometimes odd names? There may not be as many colorful stories as there are intriguing names, but some stand out, as in the case of the heirloom tomato, Mortgage Lifter. The story goes that in the 1930s a West Virginia mechanic who repaired truck radiators, M.C. “Radiator Charlie” Byles crossed the largest tomatoes he could find with the German Johnson tomato. His huge tasty tomatoes were a hit and by the 1940s he was selling the seedlings of his new tomato for one dollar each and people drove from miles around to get them. 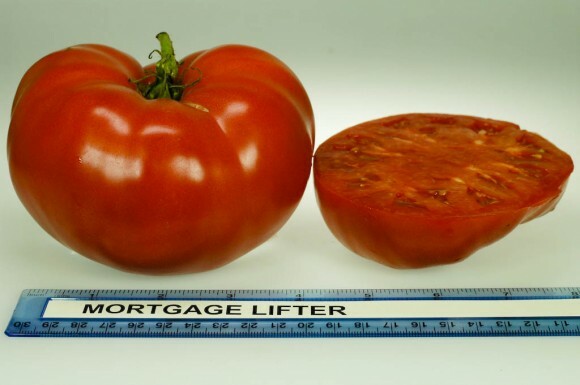 From these sales, Radiator Charlie was able to pay off the $6,000 mortgage on his home, and hence the tomato was named ‘Mortgage Lifter’. Do any of the Jersey tomato varieties have a bit of intrigue behind the names? The Rediscover the Jersey Tomato project at Rutgers New Jersey Agricultural Experiment Station has been looking at the old time varieties grown by Jersey tomato farmers and on our website we’ve highlighted four of the many varieties grown between the 1930s-70s: Ramapo, Moreton, KC-146 and Rutgers tomatoes. What’s behind their names? 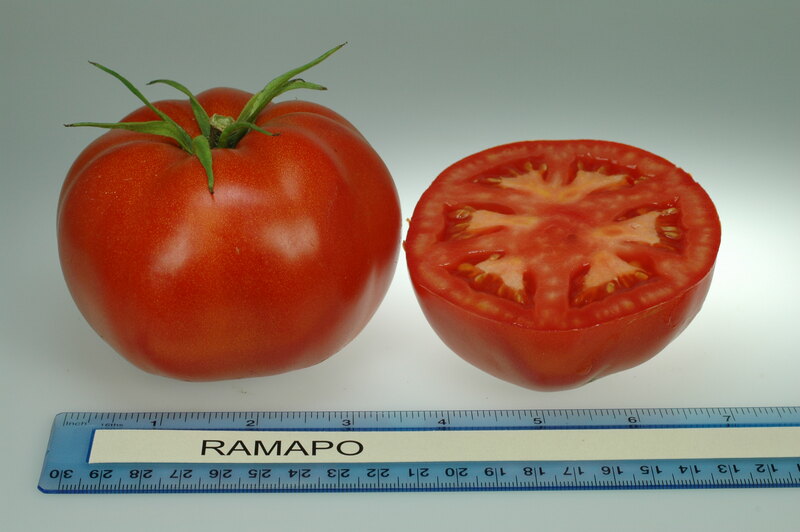 The Ramapo tomato was named for a Native American tribe that lived in northern New Jersey. Artifacts were found at the Rutgers Vegetable Research Farm when fields were prepared for planting. Dr. Pollack continues, “The Vegetable Research farm was adjacent to the Flower and Ornamental Farm, just south of the intersection of Route 1 and Ryders Lane in East Brunswick, NJ. The two farms are separated by Westons Mill Pond and that extends all the way to the Raritan River. It is believed that the Ramapo came down the Raritan River, entered the Mill Pond and camped on both shores of the pond. Artifacts were found on both farms.” This information was relayed to Dr. Pollack via the foreman of the Rutgers Vegetable Research Farm whose family lived in the area for several generations and passed down the knowledge. Perhaps Dr. Pollack’s astuteness as a vegetable breeder forged the connection to the past through the unearthed artifacts. New seeds bearing the name Ramapo went back into the same soil that bore relics of the native tribe. 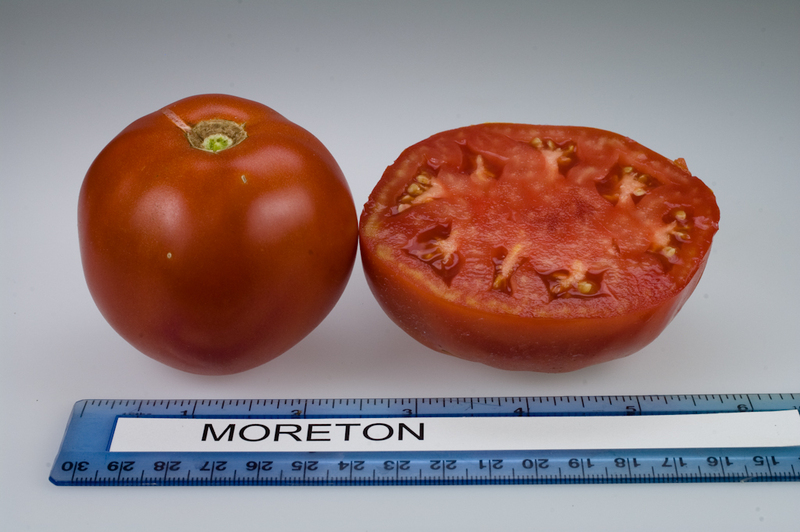 The Moreton tomato’s name comes from Harris Seeds founder Joseph Harris’ boyhood home in Moreton Corbett, Shropshire, England. It was another connection to the land that led to the naming of the Moreton Hybrid tomato, developed by the Joseph Harris Seed Company, Inc. This early season variety was grown by Jersey tomato growers in the late 1950s. The connection, however, was to a land across the sea. Joseph Harris was born in 1828 in Moreton Corbett, Shropshire, England and emigrated to the Genesee Valley near Rochester, NY, where he bought a farm and named it Moreton Farm after his boyhood home in England. In 1879, Harris opened the Joseph Harris Seed Company, Inc. at Moreton Farm. The seed company was later taken over by the next generation of the Harris family and made it successfully through the turbulent eras of the World Wars and the Depression, producing its own seed on the farm. In 1949, Joseph Harris, grandson of the founder, became president of the company. He grew up in the old family homestead on Moreton Farm. Under Harris’ direction, the company entered into plant breeding and developed exclusive varieties of vegetables and flowers. A large staff of vegetable and flower plant breeders, plant pathologists and research technicians developed new varieties and improved existing ones. In 1953, the Moreton tomato was Joseph Harris Seed Co., Inc.’s first F-1 hybrid release. 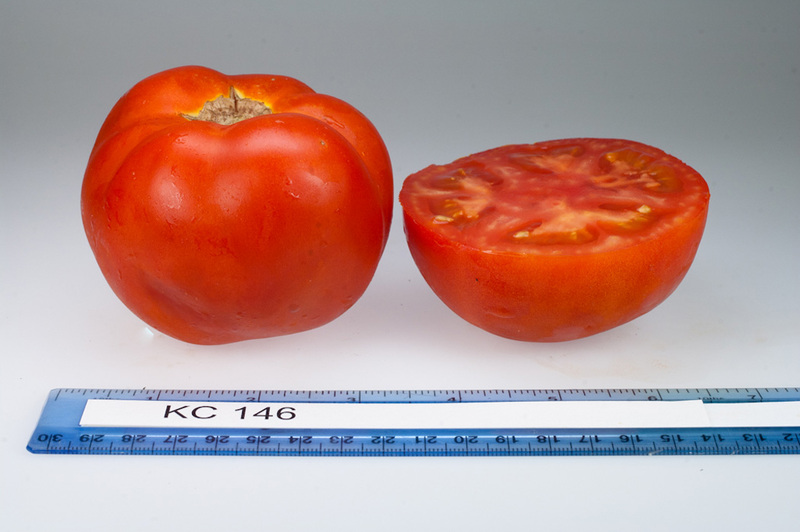 This early tomato soon became a favorite of up-state New Yorkers for their short growing season, and New Jersey growers adopted it as their early season variety to supply tomatoes by the Fourth of July. 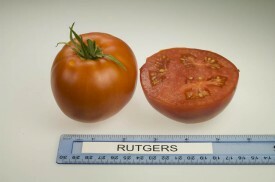 The Rutgers tomato’s name belies the tomato’s origins; the parent varieties were both leading Campbell’s Soup varieties. The next tomato on our list is a no-brainer, the Rutgers tomato. Introduced in 1934 by Rutgers vegetable breeder Lyman Schermerhorn, the variety was obviously named for the university where it was developed. The name, however, belies the tomato’s origins, for the parent varieties of the Rutgers tomatoes were both leading Campbell’s Soup varieties. Dr. Schermerhorn selected the best plants from the Campbell’s cross and for the next six years conducted field tests and made further selections until in 1934 the most superior selection was released as the ‘Rutgers’ tomato. KC-146 is also known as Campbell’s 146. And finally, the Rediscover the Jersey Tomato program recently focused on the KC-146 tomato, also known as ‘Campbell’s 146’. This tomato was developed by Campbell’s breeder George B. Reynard and released in 1956. This variety was better flavored than other processing types. KC-146 was the predominant variety grown by Campbell’s contract growers for a few years, along with another variety with good color, KC-135. As mentioned by Dr. Pollack, in some cases just a number is given as a tomato name. This is more common in releases that are commercial varieties, and in the case of the Campbell’s tomatoes, these were processing varieties. 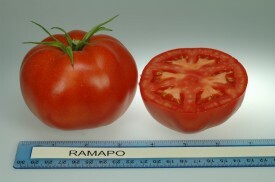 One of the parent strains of the Ramapo tomato was KCA, also derived from Campbell’s soup. What does the ‘KC’ stand for? We don’t know. We’ve asked around but haven’t yet cracked the old Campbell’s nomenclature code. So, for KC-146, we’ll confess we don’t know what’s behind the name.